I wanted the first installment to be about the initial planning stages and booking the flight and hotel. But since competition entries were due last week, I thought that made competitions the perfect first topic. Without further ado, let’s get into how I prepared for and recorded my competition entry. The first requirement to entering a competition through the NFA is to be a member. There are different levels of membership, such as active, student, and lifetime. You can also be an e-member (active or student) which means you can save a bit of money. The e-membership is the same as the regular membership, except for price and the lack of print publications sent in the mail. You instead are able to read them online. While the deadline for competition entries has passed, there are many other benefits of being an NFA member. Benefits include attending the annual convention, a subscription to The Flutist Quarterly, and access to a large music library. You can become an NFA member here. This was the first time I have entered an NFA competition, so I chose just one. I decided to go with the Orchestral Audition Masterclass Competition. Since I am out of school, I don’t have a regular accompanist. This competition did not require accompaniment. There are other performance based competitions, like Young Artist, Piccolo Artist, and more. 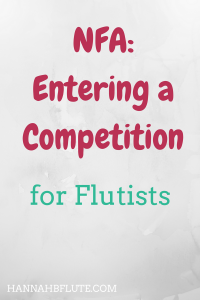 You can also participate in a non-performance competition, like the flute choir composition competition. You can enter as many competitions as you wish, but there is an entry fee for almost all of them. Each competition has required repertoire that must be performed. Some repertoire must be a certain edition, others can be any edition. Make sure you know the requirements before you buy all the music. You don’t want to purchase the pieces only to find out you needed a specific edition. After you have the music, start learning it. Listen to the pieces, study the score, follow the same learning process as you would for other pieces. Hopefully, if you are entering a competition, you are already at a high level, and you know how to learn a piece of music. For any pieces that require accompaniment, start working with your accompanist. Let them know you are preparing for a competition. The sooner you can start rehearsals, the better prepared you will be for the competition. Start doing some preliminary recordings far in advance. These recordings don’t need to be perfect or even good. They are merely a way to get you used to playing for a device. While the competition required audio recordings, I made a few video recordings and posted them to Instagram. Doing so helped my confidence. I was able to play for my recording device without any problems. I didn’t experience any nerves related to recording. Recording for fun will also help you learn from the mistakes you make. When playing, it is hard to focus on some of the details. Listening back to your recordings helps you hear things you wouldn’t otherwise. During the process of learning the music for the competition, I took the works to my flute lessons. I was able to get feedback specific to my needs from someone who knows me well. My teacher gave me tips on where and how to breathe. She also gave me tips for tricky fingerings. While I do believe advanced players, like those entering competitions, can learn a lot from themselves, nothing beats a good teacher. Feedback is important for any musician, but feedback from different sources is especially important when you are entering a competition. Different judges have their own expectations, and having a variety of people listening to you is extremely valuable. When you have learned all of the music, gotten great feedback, and made some basic recordings, it’s time to make your competition recordings. I took a day that I had all to myself and dedicated it to making sure the pieces were polished enough to record. That day, I started with my normal warm up routine. I then focused solely on the competition repertoire. I made multiple takes of each work. Having the whole day for recording allowed me to space my takes out throughout the day. I did a round or two in the morning and another round or two in the afternoon. Breaking it up helped me avoid too much tension that could bring down the quality of my playing. When recording, you want to put your best foot forward. That means you want to be well rested, and you don’t want to overwork yourself. Whether your audition is recorded or live, having that day to focus on the audition makes it easier to stay on task. Have you ever participated in a music competition? Entering a competition for the NFA was a great experience for me, whether I advance or not. I learned a lot about what it takes to be a competing musician. Leave your thoughts on competitions in the comments below!